In an effort to give Los Angeles County residents the best health care services possible, Supervisor Mark Ridley-Thomas would like to see a single unified county electronic health record system that will reduce duplication of records and increase communication between county health departments. Currently, the departments of Mental Health, Public Health and Health Services are using separate electronic health record systems. The motion was unanimously approved by the Board of Supervisors and calls for a report expected by July that will examine the cost and timeline for how to bring all departments under one system called Online Real-time Centralized Health Information Database (ORCHID). Among the three county health departments, only the Department of Health Services uses ORCHID, a system that provides unified patient records and supports various health care provider needs. 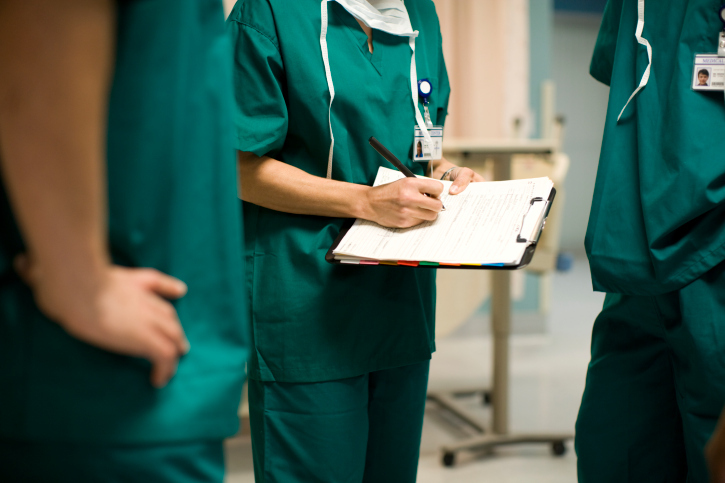 An electronic health records system replaces paper charts, allows physicians and clinical to access patient information, such as a patient’s medical history and laboratory results, without scrambling to find paper records. 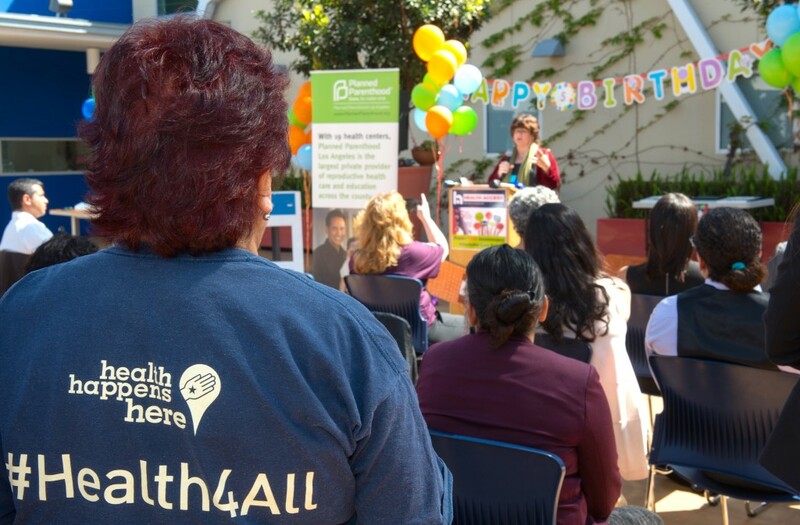 Supervisor Mark Ridley-Thomas joined healthcare advocates Tuesday in marking the fifth anniversary of the Affordable Care Act with celebration and a call for vigilance. He warned opponents remain determined to undo President Barack Obama’s signature piece of legislation, which has given more Americans access to affordable and high-quality health insurance than ever before. 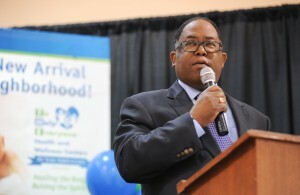 “This should be a time when we are celebrating but, in reality, the Affordable Care Act is under attack,” Supervisor Ridley-Thomas said in a news conference at Planned Parenthood. Signed into law on March 23, 2010, the Patient Protection and Affordable Care Act, also known as Obamacare, expands the affordability, quality, and availability of private and public health insurance through consumer protections, regulations, subsidies, taxes, insurance exchanges and other reforms. The Supreme Court upheld the ACA on June 28, 2012. However, a new legal challenge – “King V Burwell” – could block certain states from receiving the ACA subsidies that make healthcare affordable, resulting in millions of Americans becoming uninsured. Meanwhile, congressional Republicans who have already failed more than 50 times to repeal the ACA are now proposing a federal budget for 2016 that would not only repeal the law but also partly privatize Medicare and slash Medicaid funding. She noted, however, that California’s reimbursement rates for providers who treat MediCal patients ranks 49th in the nation. “Unless we have enough providers willing and able to care for these newly-insured people, we will not be able to realize the full potential of the ACA,” Ms. Vasquez said. 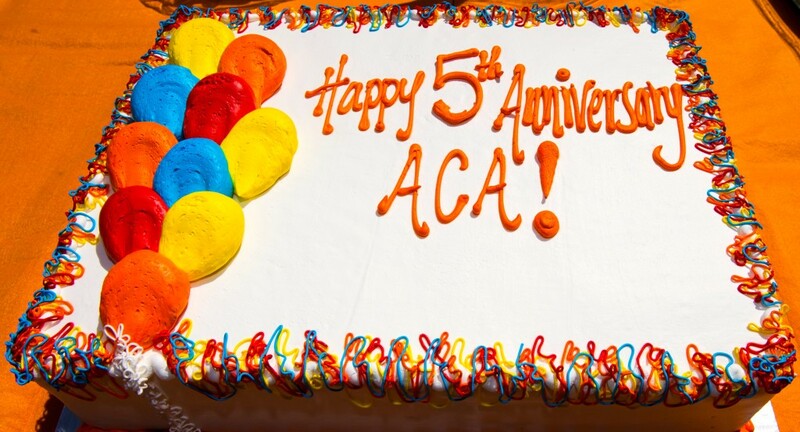 Thanks to the ACA, more than 60 percent of previously uninsured adults in California have healthcare coverage as of July 2014. 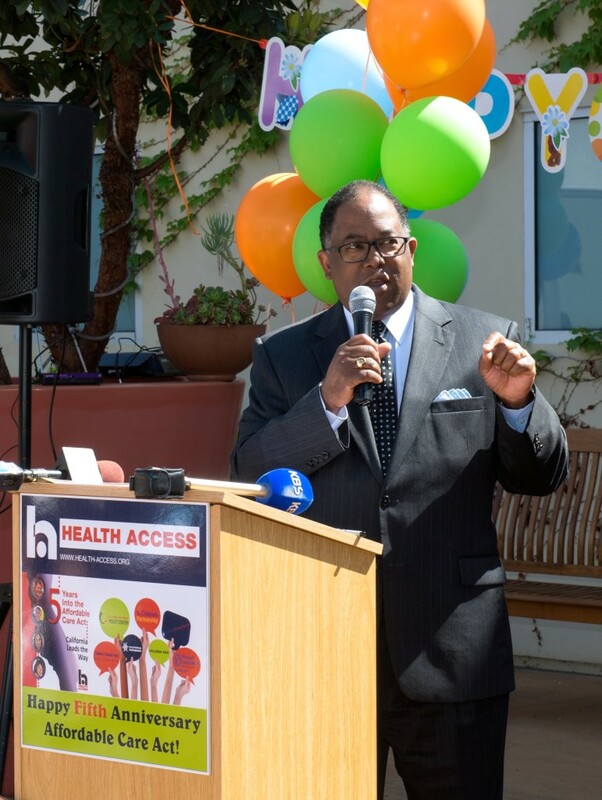 Supervisor Ridley-Thomas said the county is working to have the remainder obtain coverage under the program My Health LA, in collaboration with the Community Clinic Association and a network of advocacy and consumer groups. He also wants to expand school-based health clinics. 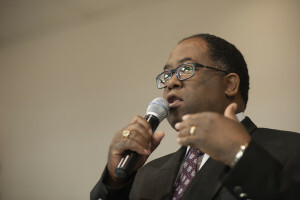 Supervisor Mark Ridley-Thomas applauded Attorney General Kamala Harris’ decision ensuring that life-saving and emergency medical services continue in the Southeast Los Angeles area for at least a decade after the sale of St. Francis Medical Center in Lynwood to Prime Healthcare Services, Inc. The Attorney General announced Friday that Prime, the intended buyer of six Daughters of Charity Health System hospitals including St. Francis, must agree to a 10-year condition to operate a Level II Trauma Center, retain emergency rooms, psychiatric services and other medical services related to Level II Trauma. The hospital must also give a one-year mandatory written legal notice of any changes in services after 10 years. In addition, the local governing board for Saint Francis must include one member designated by the Los Angeles County Board of Supervisors; provide a total of $10 million in community benefit programs for 11 years vetted by the governing board and participate in Medi-Cal and Medicare programs. Both the Attorney General and the Los Angeles County’s Department of Health Services have released reports confirming the crucial role St. Francis Medical Center plays as one of the busiest trauma centers in the county. In addition, a related January report by the Los Angeles County Department of Health Services found that the new private non-profit MLK Community Hospital — set to open later this year – could not fill any trauma care service delivery gap without a significant service expansion and financial investment for additional hospital staff and infrastructure, including the construction of new inpatient beds and operating rooms. On a busy stretch off of La Brea Boulevard, Los Angeles residents can walk into a nicely decorated, serene environment that could be mistaken for a spa. But To Help Everyone (T.H.E.) 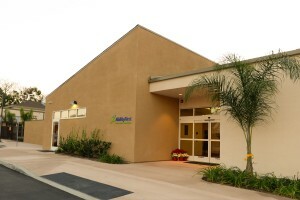 Health and Wellness medical and dental facility is really a haven for the sick. At the entrance, painted a soft blue, patients are welcomed by the motto decorating a wall: healing the body and raising the spirit. Founded in 1974, T.H.E. celebrated their 40th anniversary last year and has seen exponential growth, opening 10 new buildings in the last five years. They have two school-based health centers: Crenshaw High School and Lennox School District. They operate a mobile van at Dorsey High School. In May, T.H.E. will be opening another new clinic in the Lennox/Hawthorne area. The La Brea Wellness Center is 5,500 sq. ft. with 8 exam rooms and 2 dental chairs. With the pending sale of St. Francis Medical Center in Lynwood, the Los Angeles County Board of Supervisors is now looking into a backup plan and potential funding options to ensure life-saving services continue in the Southeast Los Angeles area and that adequate trauma care continues countywide. On Tuesday, the Board asked the Department of Health Services to look into what resources it could use, including funds from Measure B, to fill the need if St. Francis’ trauma center is shuttered. 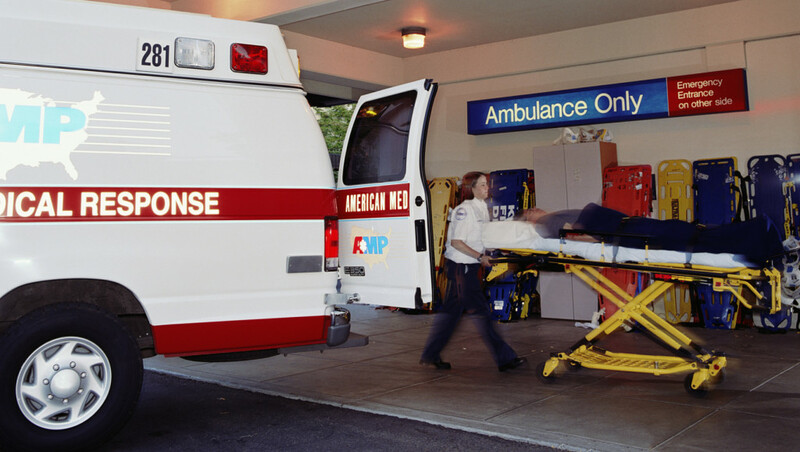 Measure B, a special parcel tax passed by voters in 2002, created a fund to preserve a county-wide system of trauma centers, emergency medical services and bioterrorism responses. 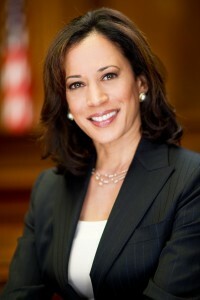 The Attorney General, Kamala Harris, is currently reviewing the sale of six Daughters of Charity Health System hospitals including St. Francis. “Regardless of the Attorney General’s action, it is critical that the County continue to explore all alternatives to ensure there is not a disruption in life-saving services,” said Supervisor Mark Ridley-Thomas, who authored the motion. The Attorney General and Los Angeles County’s Department of Health Services have both released reports confirming the crucial role St. Francis Medical Center plays as one of the busiest trauma centers in the county. In addition, a related January report by the Los Angeles County Department of Health Services found that the new private non-profit MLK Community Hospital — set to open later this year – could not fill any trauma care service delivery gap without a significant service expansion and financial investment for additional hospital staff and infrastructure, including the construction of new inpatient beds and operating rooms. Even then, it would take years to meet state certification and licensing requirements. 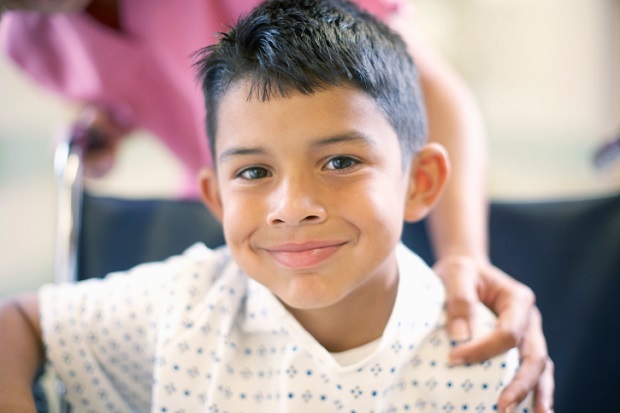 Continuing the push to protect children in the child welfare system, the Los Angeles County Board of Supervisors has approved the development of a comprehensive plan to build a new Martin Luther King, Jr. Medical Hub in Willowbrook. The new MLK Medical Hub’s mission will be to have medical and child welfare professionals provide medical and mental health services for children at risk of abuse and neglect. The MLK Hub will be the first of the county’s six hubs to receive an expansion so they can provide more intensive services to at risk children, especially those under two years of age. The plan for the new MLK Hub, which will be located on the Martin Luther King, Jr. Medical Campus, is expected to include funding options, a timeline for relocation and space where behavioral mental health services can be provided on site. The current, 41-year-old location for the MLK Medical Hub is in terrible condition, with warped floorboards, a leaking roof and dysfunctional heating and air cooling systems. The improvement of the Martin Luther King, Jr. Medical Hub was initiated as part of the Blue Ribbon Commission on Child Protection’s recommendations. Established in June 2013, the Blue Ribbon Commission was chaired by David Sanders, of the Casey Family Programs foundation, and was made up of 10 child welfare experts appointed by each member of the Board of Supervisors. In June 2014, the commission presented a list of 40 recommendations that would improve child welfare services, including giving more money to relatives who care for children in foster care, providing better medical care for children removed from their homes and improving medical screening of infants who may be at risk. A working mom, Maisha Hughes worried about sending her 9-year-old daughter Asantewa to an after school program. 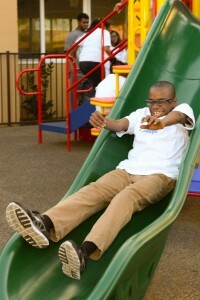 Asantewa has autism and finding the right program was always a challenge—until she connected with AbilityFirst, a non-profit organization that provides programs for adults and children with disabilities. 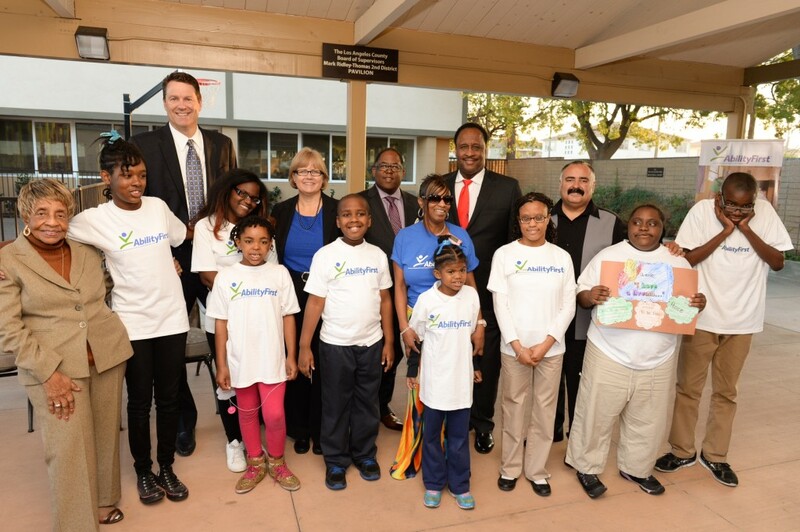 Not only is the AbilityFirst center on Crenshaw Boulevard brand new, it is literally around the corner from Hughes’ home in Inglewood. During the week, a school bus drops off children at the brand new 6,500 square foot Joan and Harry A. Mier Center after school where they can socialize, play outdoors, cook in a chef’s kitchen, draw, paint and even swim at the new indoor pool. 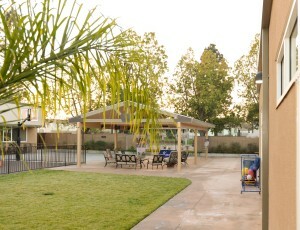 The center and its swimming pool is the only one of its kind serving children who live in South Los Angeles, Inglewood, Hawthorne and Gardena. During the summer, the center offers full day activities such as swimming lessons and even going to the movies. AbilityFirst has 25 locations, including 10 group homes, three work centers, one camp for adults and children with disabilities, eight community centers and an Ability First Employment Services office. The Los Angeles County Board of Supervisors unanimously approved looking into consolidating the Department of Health Services, Department of Public Health and Department of Mental Health into a single integrated department. In addition, the board is considering whether to transfer medical services for inmates currently overseen by the Sheriff’s Department to the Department of Health Services. The board has asked for a report back in early spring on how this consolidation would occur and how services would be provided without compromising quality. After more than two hours of public testimony from individuals concerned about any changes, the Supervisors clarified that the consolidation would not diminish much needed mental health services. Supervisor Ridley-Thomas stressed that any changes would be done with public input and through a transparent public process. He noted that Los Angeles is the only county in the state in which the Sheriff’s Department provides health services to inmates. The goal of this motion, which is supported by the Department of Health Services and the Sheriff’s Department, is to improve integration, coordination of care, collaboration and quality of care for inmates. Betsy Pfromm, president of the Los Angeles Child Guidance Clinic, a mental health provider near USC, urged the board to hold forums with constituents who want to be heard on the issue. “As a former public mental health director, I was able to meet directly with the elected officials and keep them informed as to ensure accountability,” she said. 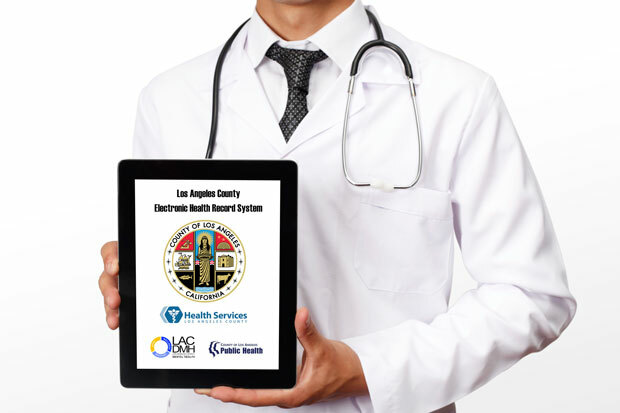 Los Angeles County’s Department of Health Services is installing a new countywide electronic health record system that could be a model for health care organizations across the country. 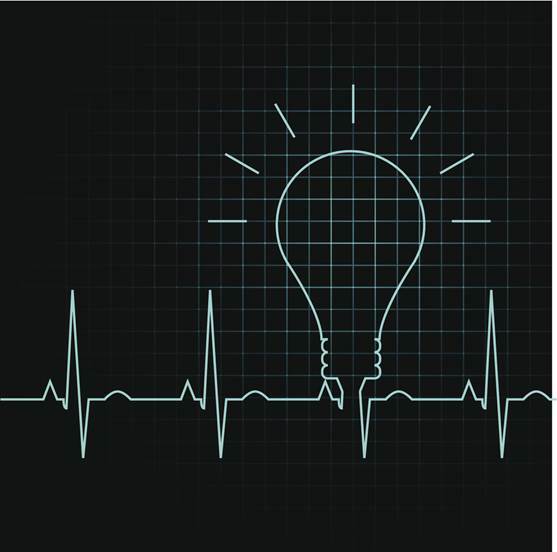 “Our patients simply need and deserve world class technology to protect their health,” said Los Angeles County Supervisor Mark Ridley-Thomas. The system, called the Online Real-time Centralized Health Information Database, or ORCHID, is the first uniform, standardized, and fully integrated electronic health record technology to be released countywide. “Having one system will bring us together as a single integrated system,” DHS Director Mitchell Katz said. With ORCHID, nurses will be able to use bar code technology when administering medications to patients. Bar code scanners will be available in patient rooms, allowing bedside bar code scanning. 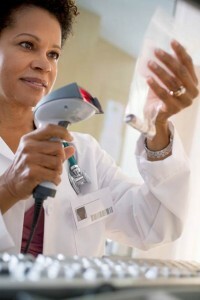 The nurse scans the bar code on the patient’s wrist and the bar coded medication label, then administers the medication. Among other benefits, the ORCHID system will help verify that the right medication was given to the right patient in the right dose at the right time. Each patient will have a unique bar code that exists only on his or her wristband. The system alerts the nurse if the medication order is expired, discontinued or if the wrong medication is given to a patient. The bar code technology will reduce the possibility of patient care errors with every pill. “The new system will result in improved quality of care, improved efficiency of care, and an innovative system that can serve as a model across the country,” the Supervisor said. Recently, the pharmacy team in Los Angeles County completed the task of scanning every unique medication for the Department of Health Services pharmacies to capture the bar codes into the ORCHID database. The process, completed by hand, included 50,000 scans. The new system will launch on November 1 at Harbor UCLA Medical Center and at the Martin Luther King Jr. Outpatient Center on February 1, 2015. The initial launch will be followed by the LAC+USC Medical Center on May 1 2015, the High Desert Regional Health Center Cluster on August 1, 2015, the Rancho Los Amigos National Rehabilitation Center on November 1, 2015, and the Olive View-UCLA Medical Center Cluster on February 1, 2016. “We are dismantling the digital divide of health care that exists in our communities,” the Supervisor said. According to the Los Angeles Homeless Services Authority, 8,713 homeless are under the age of 24 and 4,046 are between the ages of 18-24. South Los Angeles has the second highest concentration with 2,016 youth, representing 23 percent of the homeless youth population in Los Angeles County. In response to the need for strategic interventions to lower these numbers, leaders, advocates, and youth formed the collaborative to find solutions. A year ago, after the collective’s first summit, the idea of a community plan was conceived to better understand the problems foster youth face and potential solutions to youth homelessness in South Los Angeles. “No single organization is responsible for any major social problem, nor can any single organization cure it,” said Supervisor Mark Ridley-Thomas. Latrina Wilcher, 26, was born in South Los Angeles. She was at the Holman organizing breakfast to work as a caterer, and shared her story of homelessness. Wilcher said she was taken away from her mother when she was two-years-old, and after passing through a series of group and foster homes, she became homeless. Luckily, she met Janet Kelly, the executive director of Sanctuary of Hope and the co-founder of the collaborative. Kelly helped enroll Wilcher in a mentorship program and start her own catering business. For the past year, with support from the Office Supervisor Ridley-Thomas, leaders from across business, law enforcement, government, health, academic, interfaith, philanthropic and non-profit sectors as well as former homeless youth engaged in a series of meetings and committed themselves to identifying a plan to prevent vulnerable youth from becoming homeless. The meetings resulted in the “Homeless No More” community plan, a roadmap to move forward in the years ahead. “Our youth may be homeless, but they are not hopeless,” said Reverend Kelvin Sauls, the pastor of Holman United Methodist Church and the chair of the collaborative. Increase and improve housing options for homeless youth in South LA. Coordinate and enhance critical support systems and services targeting homeless TAY and foster care youth. Improve public policies and systems that address or omit homeless and at-risk youth. Produce and compile data and research that best describes the opportunities, needs, and gaps of homeless and at-risk youth in the South LA region. Expand leadership, collaborative will, and service capacity of South South LA service providers, the faith-based community, community leaders and Transitions Age Youth. “This plan provides hope for a community that has lacked resources,” said Gerald Thompson, co-founder and director of the collaborative. “Our young people deserve permanent solutions such as housing, access to a shower, clean clothes, and career opportunities. This is a bold step forward, but much work remains to deliver those solutions,” the Supervisor said. According to LAHSA Commissioner Booker Pearson, 70% of individuals in California prisons were in foster care at one time. Prison costs an average of about $47,000 per year per inmate in California. 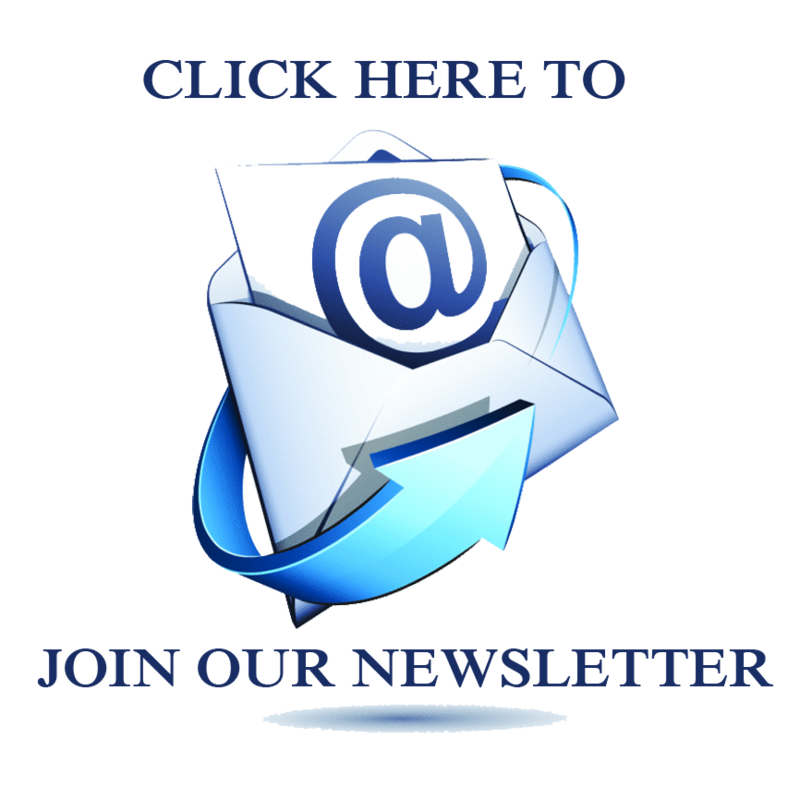 For more information, visit the collective’s website at www.southlatay.org.